In January I was officially named the editor of The Times-Delphic. It was an honor. It was also one of the scariest things I had to do. I spent the tail end of the previous semester preparing though; I knew it was coming. It also helped that I running the paper from most perspectives. I then reapplied for the position, and was once again given the good news. So I’ve been the editor for a year now. I have a semester left. It’s going to be a good one too. 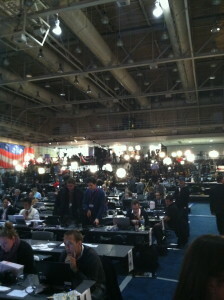 I also interned with the Associated Press in Des Moines for the Iowa Caucuses. It was an eye opening and rewarding experience all around. I don’t really remember February. It was short. So. Moving on. I believe it was the beginnings of the TD Relays Edition (a beast of a college newspaper endeavor…). March was also a blur apparently. I could go back to my tweets from then but they’d probably be about my classes and the Relays Edition. April was when the Relays Edition was in full swing. Now, if you’ve never been to Drake , or even heard of it, well, here is the shortened version of what happens during The Relays — The Relays are held once a year and is the largest outdoor track and field meet in Iowa (possibly the nation, not quite sure). I mean, it’s a big deal. People come from all over for them. Essentially, think about your college’s homecoming, multiply that by three and you have The Relays. Now, what we do at the TD is put out a massive (between 48-52 pages) edition of the paper. It’s in full color and we spend months on it. I love Relays Edition. I live for it. I had the best time doing it during my freshman year. I covered a big story about embezzlement and other smaller stories about things changing around campus. For the latest edition though, I covered stories relating to racism on campus, and stories of students whom had been directly affected by racism. Their stories really had an impact on me. I spent about an hour at a meeting for the Coalition of Black Students listening to stories. It was extremely tough to write the story. When I finally got down to it, I cried. It was 4 a.m. in the newsroom. I shut the door to my office and just cried. Cried and typed. Once everything was said and done, well, it went below the fold on page one. When May came around I took my finals and moved into my apartment. My brother turned 19, and then graduated from high school. That was really awesome. Then I had Orientation Leader training. June was a blast. I met most of the incoming first-year journalism students and helped the create schedules for the upcoming semester. I connected with a lot of them and just had a general good time. I was lucky to work with awesome people, so that helped the experience. In July I turned 21 and celebrated by going to a two-day festival in Des Moines, called 80/35. 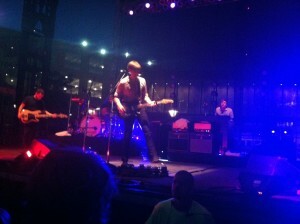 I saw awesome bands (mainly Death Cab for Cutie) and had a general good time chillin’ out in the triple degree weather. Death Cab for Cutie performing at 80/35. I also traveled to Wisconsin with one of my best friends to see Robyn play live. It should be known that I know the entire dance to “Call Your Girlfriend” and that is basically why I went. I also spent a lot of time in June/July redesigning the print edition of The TD. It was tedious. But man, was it worth it. I also wrote the publication’s code of ethics and handbook (since it was apparently lacking before hand). August was getting everything finalized for the school year. September was a blur. I covered President Obama once. Members of my Public Affair reporting class and I during the Obama Rally. I also had the opportunity to interview Rashida Jones and Adam Scott from “Parks and Recreation.” That was fantastic. October was also a blur. Until the end when I took a MegaBus to Chicago with some of my TD family. 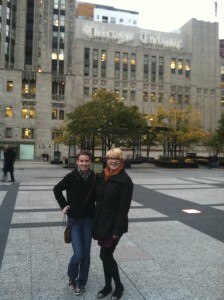 November started off in Chicago for a newspaper conference. It was amazing. I should have blogged about it. I’m going to be retroactively blogging for the next few days. I covered Obama for his final rally. December just ended….and badly. I sprained my ankle (and it still hasn’t healed). I did however, have some work done on my left leg to remove some veins that weren’t suppose to be there. Which was nice. Now, it’s January and I’ve spent most of my year in a newsroom. I wouldn’t have it any other way.